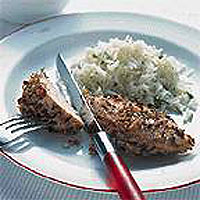 Mix the jerk marinade ingredients together and rub the marinade onto each piece of chicken. Cover and chill for at least 2 hours or overnight in the refrigerator. Allow the chicken to come up to room temperature before roasting. Preheat the oven to 200°C, gas mark 6. Place the chicken on a rack over a roasting dish and bake in the oven for 30-40 minutes until the chicken is cooked and the juices run clear. Cover with foil if necessary to prevent the meat charring. Alternatively, cook on a barbecue. Serve hot or cold with salad, rice and the Caribbean Red Pepper Salsa recipe. Equipment needed includes a sharp knife, chopping board, tablespoon, teaspoon, mixed bowl, juicer and ovenproof roasting dish with rack.